Are things not working at your church? Is your congregation aging and attendance dwindling? Are people just going through the motions and not engaged? Do folks arrive at the last minute and scurry off as soon as the service ends? If any of these questions connects with you, then this book, Rebuilt: Awakening the Faithful, Reaching the Lost, and Making Church Matter, can provide insight to bring about positive change and produce a different outcome for your church. With refreshing candor and an appropriate layer of humor, authors White and Corcoran share their journey in turning around and reinvigorating their dying church. Though written by two Catholics about a Catholic parish, this book reaches far beyond Catholicism to provide useful information for any Christian church, including all streams of Protestantism. In fact, many references in this book cite Protestant leaders, perhaps more so than Catholic sources. As such this is a book for all Christians who care about their church and want to make it better. Rebuilt provides practical ideas of what to do in reinvigorating a struggling church and how to make it work. The authors also share why things worked. But even more insightful are the honest and sometimes painful initiatives that didn’t work. Here we can learn even more from their failures than their successes. The transition that this book documents didn’t happen quickly. It took time, a lot of time, along with many moments of discouragement and frustration. But the outcome was worth it. And this gives everyone encouragement that a struggling church can change to impact its members and its community. 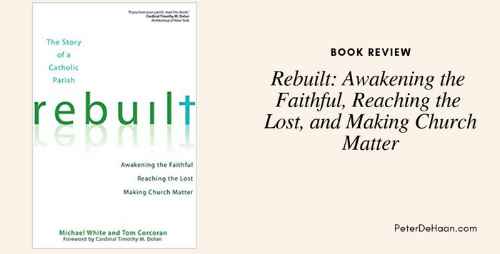 Whether you’re a clergy or a lay leader, if you care about your church and want to make it better, read Rebuilt: Awakening the Faithful, Reaching the Lost, and Making Church Matter.